Press Photo Have you ever heard about cheburek? Traditionally, this quick snack is a deep-fried turnover with a minced meat filling. However, when Gianmaria Sapia from Italy cooks it with langoustines and crab you won't think it's fast food any longer. Gianmaria Sapia lived his entire life in the Ligurian port of Savona on the Mediterranean Sea, where his family opened a restaurant well before his birth. At the age of 15 he began working in the kitchen of his family restaurant, and his first job was cleaning and preparing fresh mussels and calamari. The aromas, scents and sounds of homemade tomato sauce, fresh seafood, cheeses and the cracking of eggs is how Gianmaria remembers his childhood. 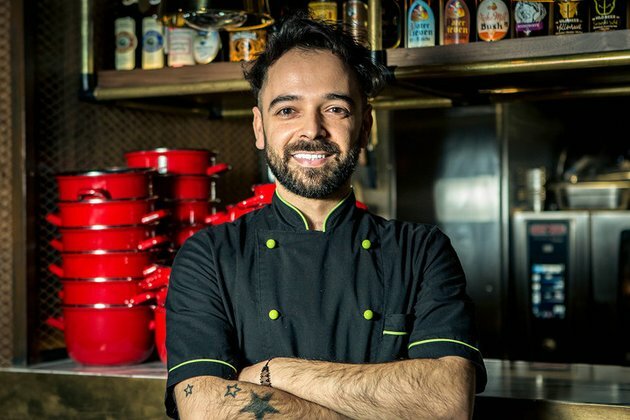 So, it's hardly a surprise that Gianmaria is now the mastermind behind the menu of Moscow's mussel-focused restaurant, Mollusca. I came to Moscow thanks to Instagram. My wife is from Moscow, and when talking to her about Russian food and culture I developed an attraction to the city. At the end of 2017, the general director of Mollusca offered me the chance to create a menu for the restaurant with the concept: "all about mussels and seafood." I immediately fell in love with the idea, and in January I was in Moscow. What is your vision of Italian cuisine? Italian cuisine is based on tradition, and no one accepts any changes to it. I have huge respect for Italian recipes, but I always try to bring something new with my fresh vision. Pasta, for example, doesn't have to be hard - it can also be soft. And fish can be served in the form of foam. And who said desserts have to be sweet? They can be salty. And that's what sets us apart from the others. Where else in Moscow can you find mussels prepared in 33 different sauces, starting from the classical Marinara and finishing with condensed milk/wasabi or Aperol Spritz? Our signature bonbons are mussels in Belgian chocolate. For now, I want to focus on what I'm doing: using my knowledge and love for food to the fullest in order to give Moscow a little piece of my Italy, but in a slightly different and less traditional form. I love it! I like shashlik, borsch, black bread, medovik cake and okroshka with kefir. The last one, by the way, took me by surprise with its amazing taste! Cut the onion into small pieces and fry in olive oil, while adding the langoustines (already cut into pieces). Add salt, pepper and wine; stir until the wine fully evaporates. Add parsley and fry the ingredients for 5 minutes before adding cream. Sautee the ingredients until the consistency becomes creamy. Remove from the stove, and add crab meat and brynza. Mix and add salt. Bring the milk to a boil and then start adding the flour through a sieve, constantly stirring. Add some salt. Place the dough into the refrigerator for 30 minutes. Spread the dough and cut out the desired shape. Add in the filling, seal the edges of the dough and deep fry until you get a crispy gold crust. A classic recipe of cheburek can be found here.